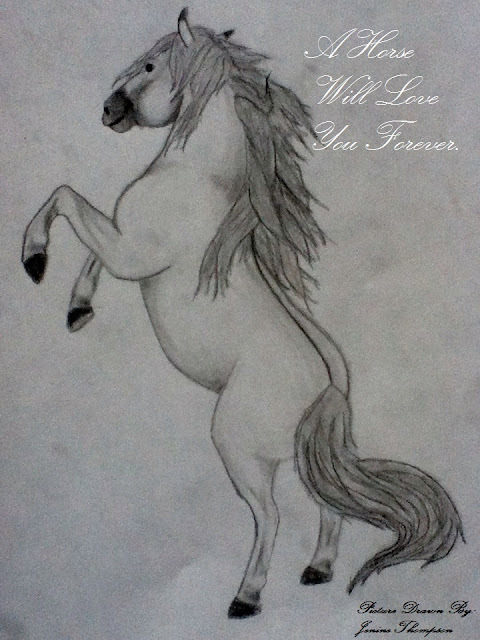 The fifth picture I chose was another pencil drawing I drew, this time of a horse rearing. I chose the saying horses are birds without their wings for two reasons. The first reason is that when you are riding a horse at a full gallop it really feels like you are flying and the second reason is that when the horses are running around outside it looks like they are trying to run and jump into the sky. They are as free and fast as a bird but they are bound to the earth. I chose the white curly font because of its elegance and beauty, which I believe is an accurate depiction of a horse. It is hard to describe to most people why a horse is so special, because unless you have ever been loved by a horse you cannot understand the special bond that is shared. I can't believe people when they say they haven't ridden a horse before! It is quite amazing. Do you own a horse or go somewhere that has a horse you're close with? Do you do jumping or any special events? I think I'd be scared to jump horses! Do you know many different breeds? Your drawing is really, really good! I ride two horses at WW Stables. They are both owned by other people and I just exercise them and care for them when they’re busy owners can't come out. Sadly I can't afford to keep my own horse, though I hope to one day. The first horse is named Renny, he is a Thoroughbred and I ride him English (smaller saddle and different gaits).He is an ex-racehorse and has way too much energy. The second horse is named Duke. I ride him western (bigger saddle, trained to neck-rein and move off of leg pressure) and he is a 'mutt'. He was rescued when he was 2 from being slaughtered and he has a lot of trust issues because he was abused. At the moment I don't participate in any events because both my horses are still just perfecting the basic skills (Duke is still in training). I do hope to one day have a barrel racing horse, as that is by far my favorite event. I know many different breeds of horses because I used to work at my barn and we had to know almost everything about the 50 horses on the property. We have mostly Quarter horses and Thoroughbreds, but we also have two Percheron crosses and a few other ‘muts’. I have some pictures of Renny on my blog (personal addition #3) if you want to have a look and I’m hoping to post some pictures of Duke sometime soon. A beautiful drawing! It's easy to see you've spend lots of time with horses, because you have drawn the angles of the body of this horse so accurately.